W0766J: Jade Head Altun Ha is undoubtedly most famed for the priceless Jade Head (fig. W0766J) that was retrieved from a tomb deep inside Structure B-4. The Jade Head is the largest single piece of carved jade yet found in Mesoamerica and weighs 4.42kg, measures 15cm tall with a circumference of 46cm. The Jade Head features a bird-like beak which has led to its designation as the Sun God, Kinich Ahua (K’inich Ajaw), who in some legends descends to the earth each day as a macaw. The burial was found amongst Phase VII of Structure B-4’s development, which has led to its designation as Tomb B-4/7 with an approximate date of 600-650AD. Inside the tomb rested the fragmentary remains of an adult male, who would have stood approximately 170cm tall (5ft 6in). Amongst his grave goods were ceramic bowls, shell beads, jadeite anklets, bracelets and beads, pearls, pyrite and haematite artefacts. The stunning Jade Head was placed upon the pelvis facing toward the skull. Because of the wealth of goods and their religious connotation, it is almost certain that the tomb is that of a chief, lord, or high priest. The fragmentary remains suggest that this was a powerful ancestor who was entombed within the temple as a relic to harness his supernatural powers. 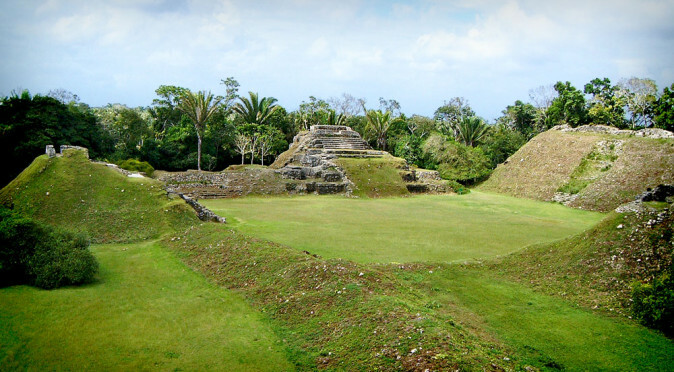 The Jade Head’s association with K’inich Ajaw has led to a theory that the priest or lord was associated with the Sun God and that Structure B-4 was therefore dedicated to the Sun God. W0765: Mask on Structure B4This theory is supported by the huge carved masks that flank the stairway of Structure B4 and bear a number of similarities to the the Jade Head. However, the masks appear to feature the tall “jester” hat (see fig. W0765) of the “Jester God” who is associated with kingship in the eastern Mayan region. 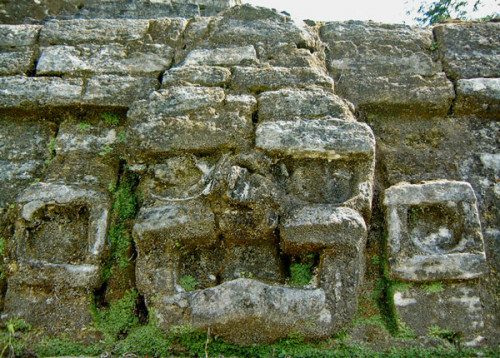 This has led to an alternative theory that the Jade Head and Temple B4 are dedicated to the “Jester God” and were designed to demonstrate Altun Ha’s divine royal lineage. 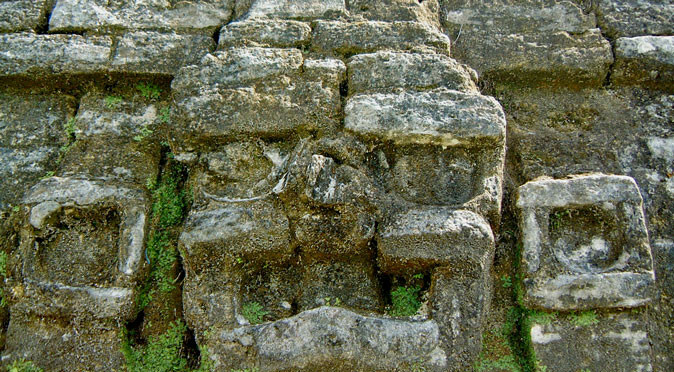 However, the masks are almost identical to those found on Structure 5D-33 at Tikal, which resemble Tlaloc, the Rain God of Teotihuacan. By creating a flattened image of the Jade Head, researchers have also uncovered imagery of maize, which would support the opinion that the Jade Head is not of K’inich Ajaw, but is of a creator God with bird-like features, such as the Principle Bird Deity or Itzamna. As well as being difficult to identify, the Jade Head is also very difficult to age. 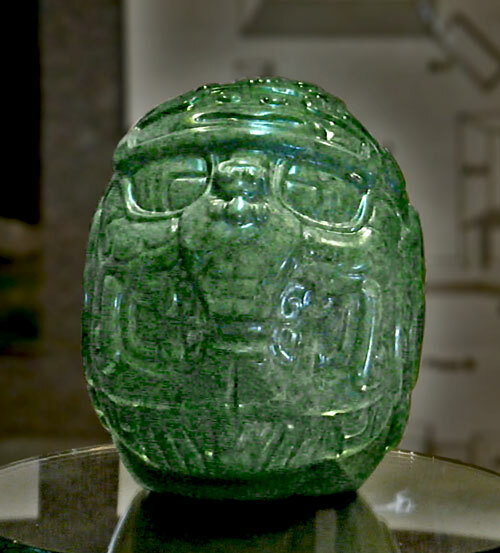 The Jade Head has stylistic similarities to the art of the Olmec and is fashioned in their favoured material, jade. This could make it an ancient relic of the Olmec Era that was passed down through generations. However, it is in such a highly polished and immaculate condition that it was either kept extremely safely, was barely used, or was made specifically for this burial. Although the latter is the most likely, because the head and the buried male may have been ancient relics that were moved to this new tomb, it is still not possible to say it is from the 7th century. 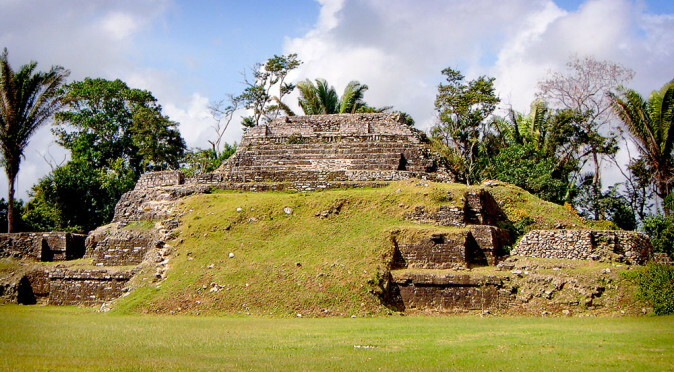 The amount of jade found at Altun Ha has led to a theory that the city may have been a manufacturing centre for carved jade, and the expertise with which the Jade Head has been carved demonstrates a very high level of skill. The jade fragments found burned around the altars of Structure B4 and the cache of over 300 pieces found within a burial inside Structure A1 (dating to 550AD) supports the idea that jade was being carved in high quantity, which resulted in the abundance of chippings being offered to the Gods through burials and burning rituals. 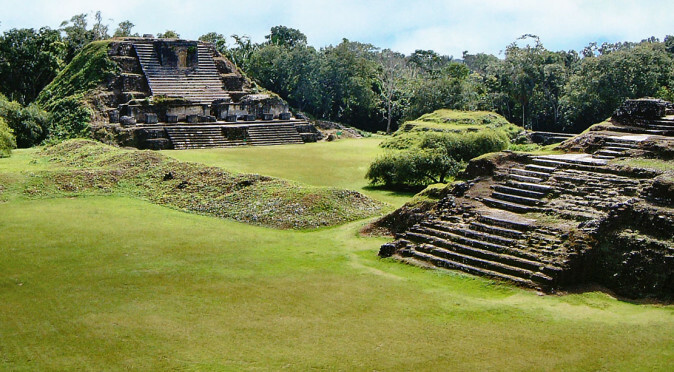 Altun Ha’s proximity to the Caribbean coast would have meant that moving large amounts of jade from southern Guatemala over water would have been easily possible and this may have been the reason for Altun Ha’s rise to prominence in the Pre Classic Era. 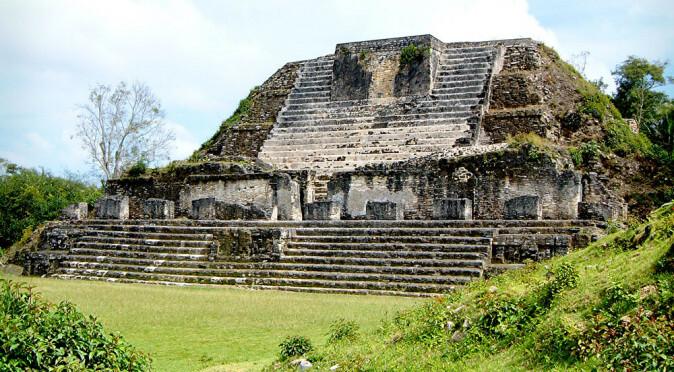 Regardless of Altun Ha’s part in the construction of the head, the reasons for its burial, its age or its symbolism, the Jade Head firmly places Altun Ha amongst the wealthiest and most powerful cities of the ancient Maya. To this day, the Jade Head is of such value and importance that it is locked away in a bank vault and only sporadically brought out on display. It also features on Belizean money and is a national icon.